Primary care plus behavioral health services. At Edgewater Health, we know the importance of good health in both mind and body. We are pleased to offer both Primary Care and Behavioral Health services. Meet the people who treat you like family. We accept Medicaid and many other insurance plans. If you need financial assistance, we may be able to help. At Edgewater Health, it is important to us to close the loop between physical and behavioral health. Our mission reflects a proactive approach to addressing all aspects of health—both behavioral and physical. We recognize that caring for the “whole person” is the key to being healthy and staying healthy. 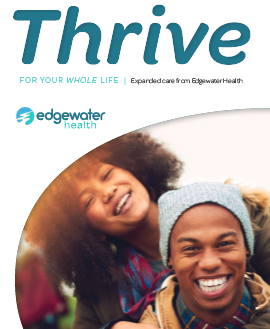 Stay up-to-date with the latest news, tips for healthy living, and positive lifestyle habits from Edgewater Health. To be added to our mailing list, please fill out this contact form.